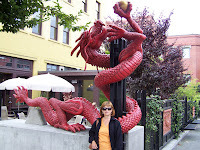 Victoria has one of the oldest China Towns in North America. It is a facinating place and is full of mystery. It has a network of narrow alleyways and a good number of restaurants and shops. The photo to the right shows a unique statue on the corner of Pandora and Government Streets. Check it out. It is not big but very intersting.